Previously on The Great British Bake Off: We kicked off with cake week and met our new batch of Bakewells. Marie’s steady but outstanding work won her star baker, Dorret’s black forest cake collapsed into a Bingate-worthy puddle, and Stu was shown the door. Biscuit week! The Bakewells roll into the tent while Mel and Sue welcome us. Once everyone’s settled, the Signature is announced: 24 biscotti. Mmm, my mum makes some really delicious polenta biscotti. Her grandmother’s recipe, I think. They have two hours. Mary tells us that biscotti are unusual because they’re twice baked. Paul thinks he and Mary both have similar tastes in biscotti: Cranberry, hazelnut, and chocolate. Alvin shows off the jackfruit he’s going to use in his pistachio and macadamia biscotti. The judges wish him luck. He’s the only one not using a dried fruit. Mat is doing cranberry, pistachio and white chocolate biscotti. Paul warns him not to let the cranberries turn into bullets. He says that a guy at work loved them. Everyone’s dough seems really wet. Ian is using rosemary, along with orange and almond in his biscotti. That actually sounds really delicious. Actually, I think a more savoury biscotti could be quite intriguing. Doughs are coming together. Sandy, making a chocolate chunk and hazelnut biscotti, says she’s a tiny bit worried about having to make these all uniform, since that’s not her thing. Paul is doing fig, hazelnut and chocolate biscotti. Mmmm. He’s the only one making a chocolate dough, which Paul points out is tricky, because it’s hard to tell if it’s finished baking or not. Ugne’s going the unusual route and making white wine biscotti with goji berries. She says she likes to experiment. Clearly. Dorret is including amber sugar crystals, sprinkled over the top. Paul is intrigued while Mary worries they’ll be really hard when you bite into them. Biscotti go into the ovens and timers go on while the VO says that the timing is crucial, since baking them even a teensy bit too long will result in burning on the second bake. Nadiya is doing coconut, pistachio, and fennel biscotti that’s inspired by one of her mother’s Bangladeshi recipes. Biscotti start coming out of the oven. Sandy’s are quite flat. Alvin’s are quite wet. Others are fairly pleased. Tamal pulls out his physalis, cinnamon, maple, and cranberry biscotti. Wow, there’s a lot going on there. He’s also topping them with homemade praline. Mmmm. Everyone agrees they look like lovely ciabatta. The Bakewells start fanning their biscotti with sheet pans to cool them faster, so they can be sliced. Marie’s are really fragile and she thinks she might have put too much fruit in them. Paul (the judge) wanders past with a cup of tea and she grabs him so she can conspiratorially tell him about how she screwed up. For some reason, I find this really hilarious. Biscotti go back into the ovens for their second bake. Some of Tamal’s have toasted a bit on the edges. Biscotti come back out and are frantically cooled, arranged, and decorated. Nadiya realizes she forgot to put the fennel seed in the biscotti, so now she’s mixing it with the coconut she’s putting on the outside. Time is called and the bakes are presented. They all look quite lovely. Mat’s pistachio, cranberry and white chocolate look beautifully even and have a good crunch. Paul declares them a nice biscotti. Nadiya’s look nice and even, according to Mary, and Paul likes the fennel. Marie’s biscotti Italiano aren’t as uniform as they should be and the chocolate on top hasn’t set because they were warm when it was added. Good crunch and flavor. Ugne’s white wine biscotti have great texture and Mary loves the flavor. Alvin’s biscotti are delicious but a tiny bit soft. They needed a little longer in the oven. Sandy’s chocolate and hazelnut are great. Dorret’s almond and apricot with the amber crystals don’t have much flavor and Paul doesn’t like the sugar on top. Tamal’s cinnamon, maple and chocolate are good but Paul longs for one overriding flavor. Paul’s chocolate, fig, and hazelnut have a great texture, so well done on judging the timing. Mary’s not crazy about the flavor combination, though. Really, Mary? You don’t think that figs, hazelnuts, and chocolate go? I sure as hell do. Flora’s wedding biscotti aren’t quite uniform but she managed not to be too overpowering with the fennel. Ian’s orange, rosemary, almond biscotti have everyone excited to try. Paul declares them a really nice biscotti. They do sound delicious. Time for our first history lesson of the season. Once upon a time, biscuits were boring, but in the 19th century a new biscuit, the Pearl biscuit, was introduced that didn’t have pinpricks to allow steam to escape, so it rose and had a soft, crumbly texture the Victorians adored. Demand was huge and a massive new factory was built. Soon, the Pearl was overwhelmed by the Garibaldi biscuit, then the Bourbon biscuit. Time for the next challenge: the technical. It’s a Paul recipe and he warns the bakers not to rush things. The Bakewells have to make Arlettes, light cinnamon-flavoured biscuits. Off they go. Flora, who has over 100 cookbooks, mostly French (of course) has never heard of these. In their little pavilion, Paul says these can be super tricky. They’re almost like super thin puff pastry. They do look really yummy. He’s sure they’re going to get some screwed up shapes. Nobody knows what the heck they’re doing. Flora figures she should build up some gluten, and Sandy says these seem rather complicated for a biscuit. They roll out dough into a rectangle, then chill it while they whip the butter, then roll it flat. The dough is then wrapped in the butter. Well, that’s unusual. Typically you wrap dough around the butter. Marie’s having trouble with her stuff sticking to clingfilm. Everything’s thrown back in the fridge, then pulled out after a while and rolled out again. This is how you get all those lovely layers in your puff pastry. Cinnamon and sugar is scattered over the dough. Sandy accidentally adds it twice. Flora can’t seem to figure out how to roll the dough up. Once it’s rolled Swiss-roll style, it’s sliced and then the slices are rolled out very thinly. The biscuits are baked. Flora obsessively watches hers, worrying about burning because of the high butter content. Halfway through baking, they’re flipped over and tossed back into the oven. Something seems to be wrong with Marie’s oven. She’s not sure they’re going to be ready. Biscuits start coming out of the ovens and are plated. Time is called. Paul and Mary return and take in the array of Arlettes. Dorret’s look decent and are crispy. Mary likes the texture. They’re good. Sandy’s are a little too thick, but a good colour and have a good break. Ian’s are kind of dry. Marie’s only managed to get four on the plate, but the ones she got there are good. Alvin’s were rolled up the wrong way, so he didn’t get much of a cinnamon swirl in there. Flora’s are nice and thin and break well. Mat didn’t roll his thinly enough. Ugne didn’t get the lamination or an even cinnamon distribution. Paul’s are kind of a mess. Tamal didn’t do spectacularly either. Nadiya’s are too thick and underbaked. Places, last to first: Marie, Paul, Nadiya, Tamal, Ugne, Alvin, Mat, Sandy, Ian, Flora, Dorret. Well done, Dorret and Flora! So, who’s on top and who’s flailing? Dorret’s pulled herself out of the bottom, but Paul and Marie are struggling a bit. Mat, Ian and Alvin are up at the top. Not Flora? That surprises me. Showstopper! This week, they have to create 36 biscuits, presented in a box made of biscuit mix that’s different from the biscuits inside. Simple, right? They fly into action. Paul wants to see some architecture and precision. Mary says the box needs to be tough, like a gingerbread. She wants delicious ambition. 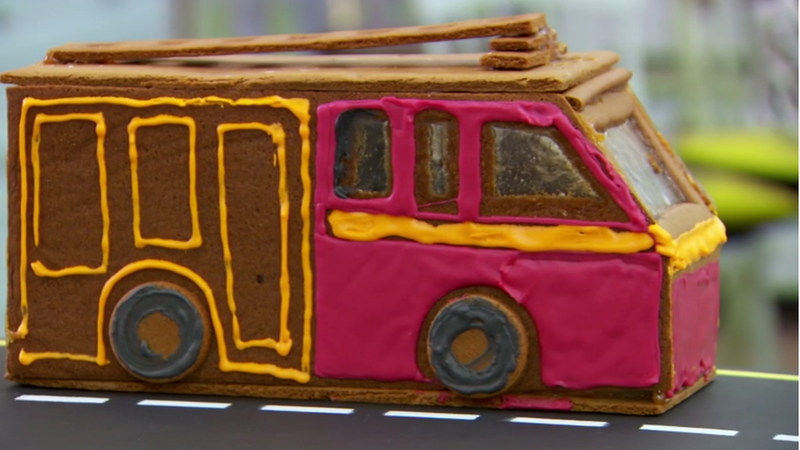 Paul is making a gingerbread box with pink macaroons in honour of his pink-loving wife. Aww. The box will be decorated with personal things, such as images of himself as a Coldstream Guard. Alvin is also making a gingerbread box but filling it with brandy snaps. Most of them are using gingerbread, actually, since it’s super sturdy. Nadiya is doing a ginger and cayenne pepper box. That sounds delicious. She’s also trying to make it rounded, which will be interesting. Inside will be 36 fortune cookies with actual fortunes inside. Tamal is making a gingerbread flavoured with star anise instead of ginger, filled with chess shortbreads. Sign me up! Flora is making honey and lemon shortbread with Earl Grey-infused biscuits. I love Earl Grey biscuits. I actually made hundreds of them to give out as favours at our wedding. They were delicious. Ian is doing a cylindrical shortbread case with macarons inside. Ambitious. He insists it works at home, but I can’t help but wonder how he manages to get the shortbread to bake without just melting down the sides of the cylinders. Sandy is going savoury with a sundried tomato chess biscuit box filled with cream cheese filled Parmesan rounds. Interesting. Nadiya is shaping the base of her box around a bowl. Mat is making a gingerbread box shaped like a fire truck (he’s a fireman), filled with Earl Grey tea biscuits. He wants to put crushed candy windows in the fire engine. Good luck, Mat. Remember that didn’t work out so well last week for one of the bakers. Box bits go into the ovens and the Bakewells get started on the interior biscuits. Marie is staying true to her Scottish roots and filling her box with cinnamon and orange shortbreads. Ugne is doing Lithuanian cottage cheese cookies with cinnamon and sugar, housed in a jar made of Lithuanian honey cake. She just hopes nothing will fail today. Good hope to have. Mat and Paul work on their macaroons. Both are going to be pink. Dorret is filling a gingerbread lily pad box with shortbread frogs. Paul wonders if stamping out the frogs isn’t a bit of a shortcut, which is PaulSpeak for: this is a shortcut. We will be counting it against you. Boxes start coming out of the oven. Some have puffed too much, some have melded together, others are fine. Ian’s cylinder came out ok. Nadiya’s bowl collapsed, so now she has to do it again. Halfway through, filling biscuits start going into the oven. While those bake, they start assembling the boxes and decorating them. Marie’s shaking and says she’s making a huge mess of this. Mat’s fire engine is looking really cute. Nadiya’s box is still cooling and she’s freaking out, because she’s not going to have enough time to decorate it. She’s sure she’s going home. Alvin is way behind. He’s frantically icing away, but he’s not sure he’ll be able to finish the brandy snaps. He decides to abandon the box, since he doesn’t have time to put it together. Sandy’s worried that she’s the only one doing savoury biscuits. Well, she says she’s worried. She doesn’t sound it. Flora accidentally cracks part of her box right in half, and Sue somehow destroys Nadiya’s box. Oh COME ON! At least once a season one of these two destroys something one of the bakers is working on. Stop mucking about with stuff on their stations!Nadiya somehow manages to just laugh about the whole thing. Boxes are coming together and are being filled with biscuits. Time is called, and they step away. Some of them look really great. Ian’s sandwich filled with macaroons impresses Paul with the cylinder. The macarons are great, the box is nice. Flora’s honey and earl grey box is declared ambitious by Mary, who thinks that Flora probably panicked a bit and ended up cracking the top in half. The piping is really good and the biscuits are delicious. Alvin’s just stacked his box pieces beside the brandy snaps, which naturally does not go over well with Paul and Mary. He actually bursts into tears over it. Mary says it’s really sad he couldn’t get it put together, but the box and the brandy snaps are fab. Marie’s Russian box looks fairly elegant but the biscuits seem plain to Paul. And the flavours are just ok to him, though Mary’s fine with them. Mary thinks the box is too soft. Sandy’s sundried tomato box gets high marks from the judges for appearance, but they don’t get the sundried tomato flavor. The interior biscuits are a little soft for Mary, but delicious. Tamal’s chessboard box looks really beautiful, and the chess biscuits inside look and taste quite nice. Mary notes that the star anise flavor of the box comes right through. Mary thinks that Ugne’s box looks garish, and she’s not wrong. It’s got all sorts of ugly frosting flowers and things, and a totally creepy pair of baby legs, in an attempt to look like a kid’s sneaking into the cookie jar. Flavour’s ok, though. Paul loves the cookies inside, though. Dorret’s box of frogs looks cute, and the frogs are crispy, but the flavour’s not very good. The gingerbread box is good though. Nadiya’s box is sans dome because of Sue, who admits that she was the culprit here. There was no time to decorate it, but Paul loves the flavor of the biscuit. The fortune cookies are a Bake Off first, and they too are good. Paul’s box looks good, but his macarons are various sizes and there’s too much filling. Nice gingerbread, though. 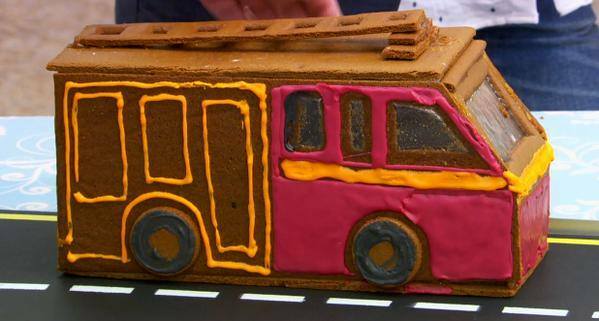 Mat’s gingerbread fire engine is super cute. He got the windows to work and everything. Interior and exterior biscuits get high marks. Afterwards, the judges and hosts confer. Mat and Ian are way up there, along with Sandy. Mel notes that there were some erratic performances. Dorret, for instance, did well in the technical, but stamping out a biscuit seemed rather a cheat. And Alvin being unable to make a box is a problem. Marie, too, has fumbled. Mary doesn’t think Marie has managed to lift herself out of her comfort zone. Paul, too, is on the chopping block, though it doesn’t seem like he deserves it as much as some of the others. Everyone re-gathers in the tent. First, star baker: Ian! Yay! I definitely want your biscotti recipe. And they must say goodbye to…Marie. Damn, from star baker to going home in just a week, that’s a hell of a leap. She puts a brave face on, though. That Scottish stoicism is a hell of a thing to see.